The Middle East may have some of the most opulent and extravagant buildings in the world but it also has some of the latest construction standards in terms of fire safety, often ignored in the rush to build. The Villagio Qatar Mall is a classic example of opulence, its Venetian themes gives it a grand canal at its centre, 220 stores, 360 000 sqm of retail GFA, Marks and Spencer, Next and Lois Vuitton as well as an incredible footfall for the region (where malls are often near deserted due to oversupply) of 42,000 per day. Yet this morning around 11.00am a major fire break out close to Entrance three. Reports from social media suggesting casualties were quickly dismissed however it is now confirmed that there were 19 deaths, including 13 children (including 3 triplets), 2 nursery supervisors and 2 firefighters. Why was the causality rate so high. Looking at the mall plans you can immediately see a number of key design faults in terms of means of escape. We know the fire broke out near gate 3 and two major stores were gutted. These were likely to be the Masimo and Zara stores flanking the entrance from the TV images. 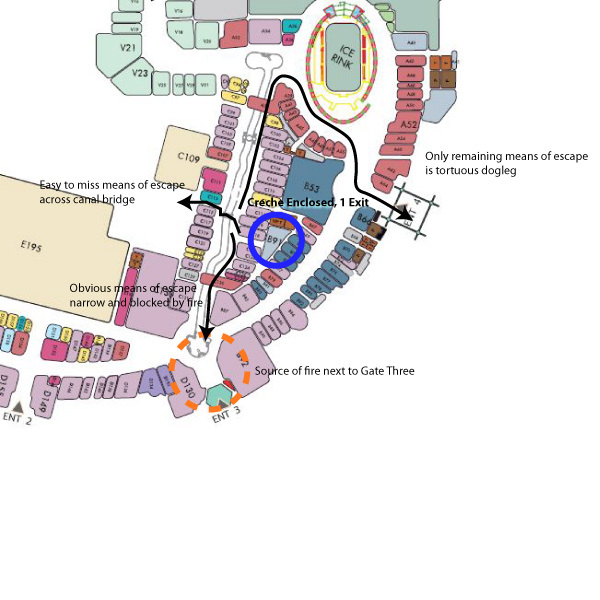 The major source of casualties was the Gyampanzee children’s play area (B91 on the map) which despite being a high risk play area for children has no direct means of escape the nearest fire exist being over a ‘bridge’ over the ‘grand canal’ and out onto the service yard. Many would I imagine attempt to pass down the cramped alleys next to the canal where the direct means of escape would be directly to the source of the fire gate three and the better gate 4 being a long dogleg away. Smoke would have quickly filled the area. As an open plan mall there are no fire doors. The poor children didnt stand a chance. c. located adjacent to an external wall and has at least 2 exits, one of which must be directly to a place of safety. No one seems to be owning up to be its architect, however whoever it was should deserve a jail sentence. Update: We now learn there was no sprinklers or smoke alarms at the mall – incredible. Wow, I hadn’t heard of this. I’m responsible (among other things) for insuring adequate fire escape paths in a large manufacturing facility – this reminds me how important the work is and how diligent we have to be. Reblogged this on التخطيط في سورية Syrian Planning. Clearly it is the management mistake to allocate a nursery in the middle of this mega mall !! Thank you for the good analysis. An important detail is missing. The Gympanzee nursery is situated in the first floor. To access to it, you have to take a corridor for the main Mall’s alley then turn left and continue in another corridor (width=1.25m approx.) then you have to find the lift or a door to get access to the stair case and the first floor where is the nursery. I had the chance to visit this nursery once because my kids heard about it and wanted to be there, we had a look and I remember I did find it like a trap or a tomb. Only one access, no escape, no windows. I do remember I told my kids I can not let you be here it look dangerous, if I have to do it then I have to stay with you. I off course never went there again and I did never take my kids to that nursery. Today I sometimes feel sad…why I did not go to talk to the management of the mall and tell them that their nursery is very badly located… maybe because I tought they tell me it is not your business…. it is not right to say that it is a design fault. I am hundred percent sure that the nursery space was not designed to be a nursery or even to be rented…. when the Villagio mall opened the Gympanzee nursery did not exist…it was something like a lost space and someone wanted to make profit of it…. We supply Fire Extinguisher Sales for Home and Business, Fire Risk Assessments, Fire Safety Training, Fire Prevention Accessories and excellent Customer support as well as give quality free advice. We also provide incredible free next day delivery to Ireland and very competitive price on delivery elsewhere! Why not just check us for a competitive quote at http://www.sfsarmagh.com Thanks! IFE Accredited Fire Manager and warden Training by UK – Middle east Specialists.